Never heard of Blunch? It’s about to be your new go-to meal of the day: it offers the perfect combination of your Breakfast and Lunch favorites. Now you don’t need to wait for the weekend to indulge in fluffy pancakes, scrambled eggs, mimosas and bloody marys! 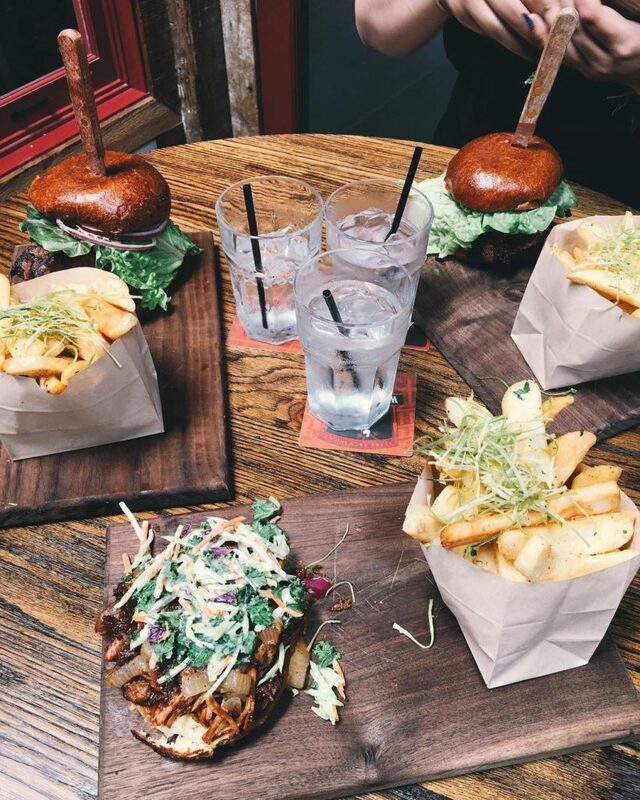 Here are the 7 reasons why you need to try Blunch at Garage Kitchen + Bar in the heart of San Diego’s Gaslamp District. Can’t choose between breakfast and lunch and you don’t want to wait until the weekend for San Diego’s infamous Brunch o’clock? We’ve got you covered. Garage Kitchen + Bar serves Blunch Monday – Friday 11am-3pm. You can enjoy breakfast favorites like pancakes and lox toast, or you can go for a traditional burger or fresh salad. More breakfast fun to go around. Garage Kitchen + Bar serves signature Cereal Shots every day of the week! They are the perfect blend of your past and present. 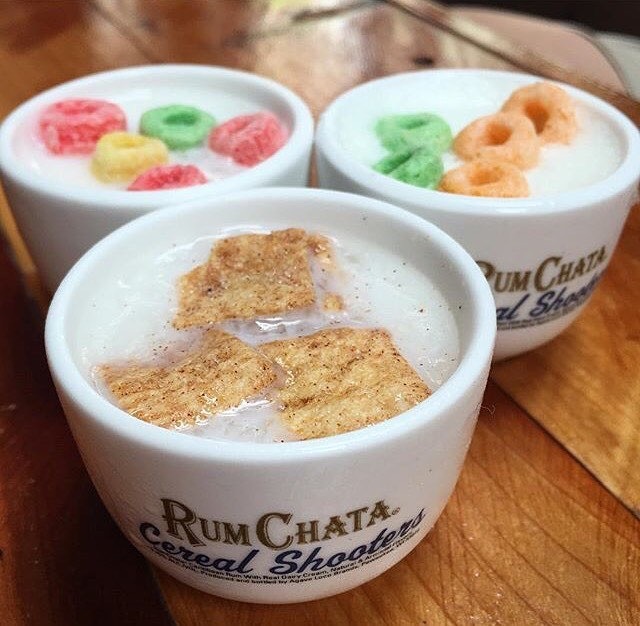 You can choose from Froot Loops, Apple Jacks, Cocoa Puffs or Cinnamon Toast Crunch: the perfect boozy addition to your childhood favorites. Make your business meetings special. 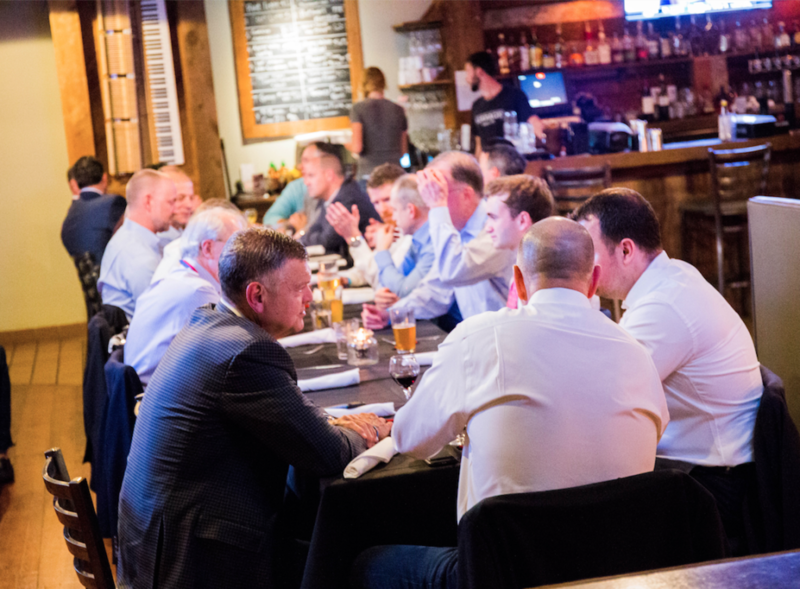 Looking for a fast, enjoyable and professional location for a business lunch? We have a private dining area upstairs that is perfect for an afternoon meeting! 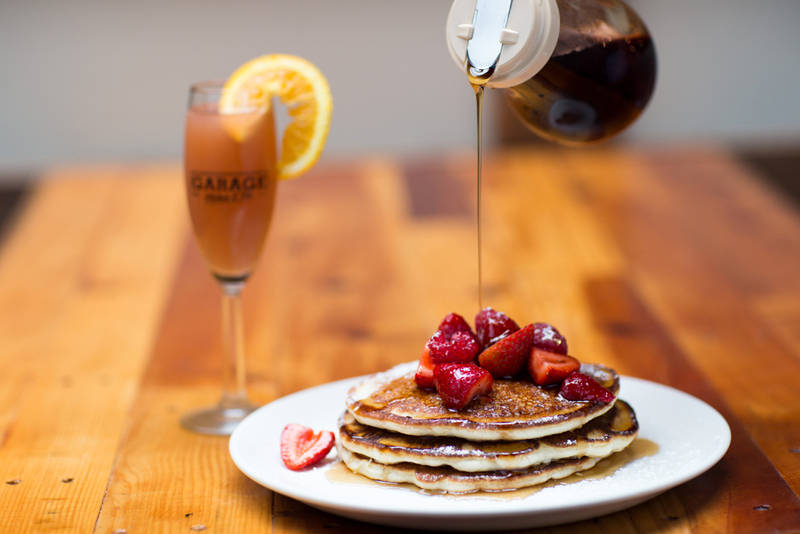 Take your guests to Garage Kitchen + Bar! With free wifi and a menu with a variety of options, you’ll be able to host a proactive and delicious business lunch. *You can also reserve the upstairs for private events and employee parties! If you’re with a big group of friends with different tastes, it’s hard to find a restaurant that can accommodate everyone. 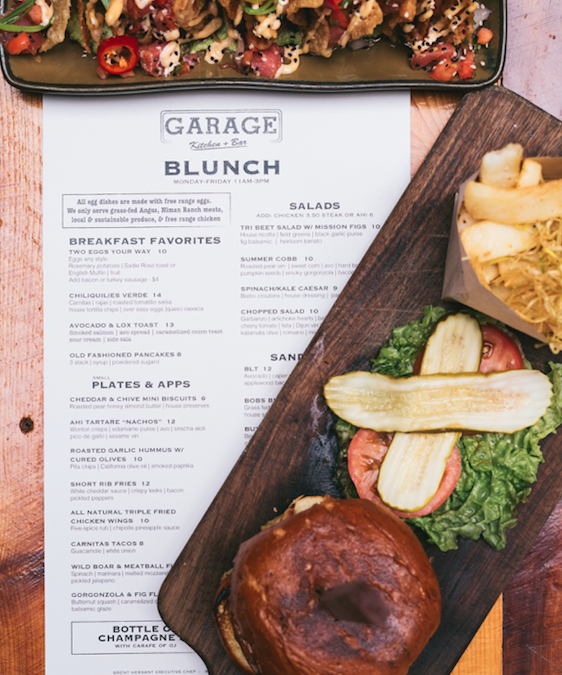 At Garage Kitchen + Bar Blunch you can choose from fresh Ahi Tartare “Nachos”, a hearty BLT, Vegan Burger, crisp Cobb Salad, a Seared Ahi & Brown Rice bowl and much more! Shop ‘til you drop, and then refuel. The Gaslamp District is the perfect place to get those steps in and shop ‘til you drop. What’s the best thing after a long day of shopping? A mimosa of course! 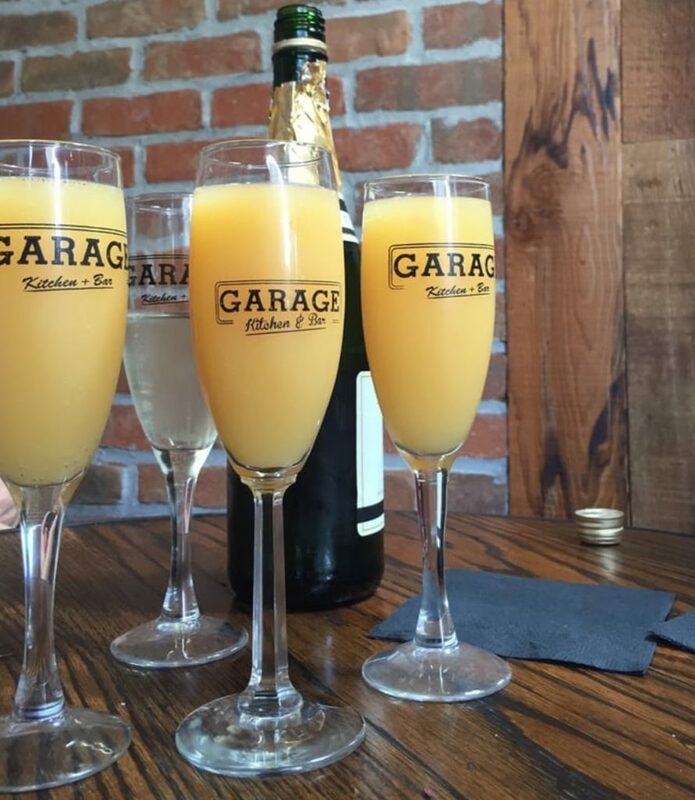 Garage Kitchen + Bar serves $7 signature mimosas during Blunch, ranging from grapefruit to pineapple and lavender. *Park in Horton Plaza and we’ll give you a voucher for $8 flat rate parking all day long. 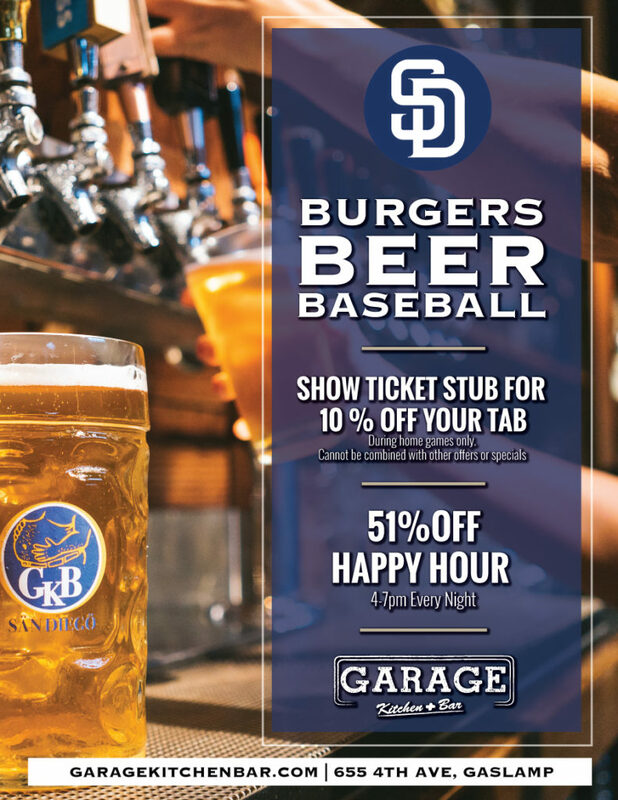 The San Diego Padres have a lot of afternoon home games, and the Garage Kitchen + Bar is the perfect place to start. 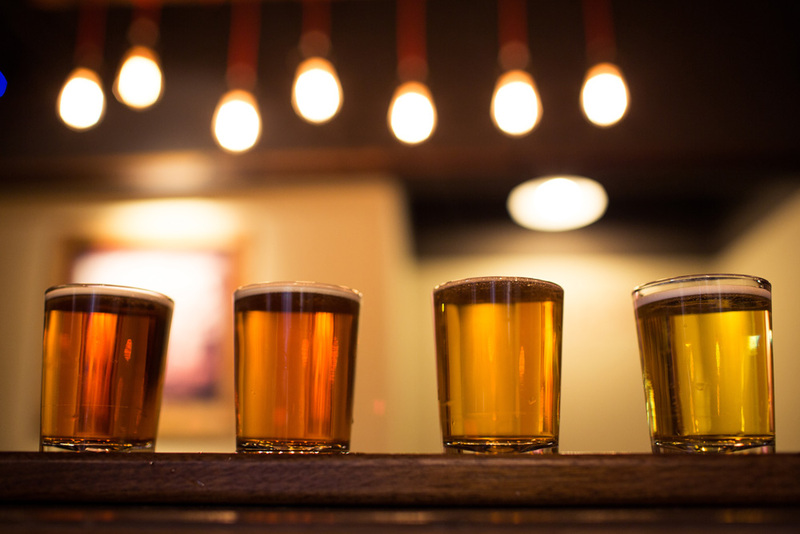 Located within walking distance of Petco Park, you can enjoy appetizers, craft beers, and other specialty cocktails before the game. *If you show your ticket stub, you get 10% off your entire tab. Enjoying Blunch? You can stick around for 51% Off Happy Hour every night from 4-7pm and keep the good times rolling. Try different specials every day of the week: from $2 Carnitas Tacos on Tuesdays to our $6 Coffee & Doughnuts dessert on Thursdays!